Shadows of Self, the fifth in the Mistborn series and the sequel to Alloy of Law, shows Mistborn’s society evolving as technology and magic mix, the economy grows, and religion becomes a growing cultural force. The bustling, optimistic, but still shaky society that came out of the first Mistborn trilogy now faces its first instance of terrorism—crimes intended to stir up labor strife and religious conflict. Wax, Wayne, and Marasi must unravel the conspiracy before civil strife stops Scadrial’s progress in its tracks. 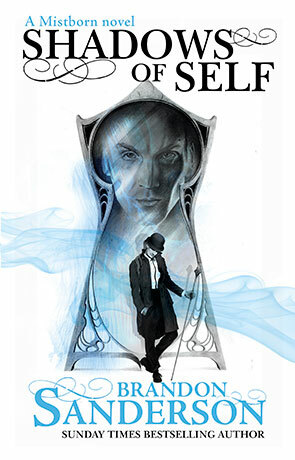 I have loved the Mistborn series from the very first book, and Shadows of Self does not disappoint. The novel follows the main characters as they struggle against a powerful enemy, who’s pretty good at stirring up turmoil. Sanderson does a fantastic job with twists and turns (I guessed a few of them, but the biggest, final twist caught me completely by surprise). The book happens over the course of days, but we learn a lot about the world that has evolved so much since the first Mistborn novel. And though the plot is enjoyable, fast-paced, and full of action, what I really loved was the expert worldbuilding. Though Shadows of Self and Alloy of Law feel more action-y and less deep than their predecessors, I adore their quick-paced action. The trick is not to compare it to the first Mistborn series too much—they’re different, and they’re allowed to be different. Shadows of Self takes on the Mistborn world and builds on it brilliantly. We got bits and pieces in Allow of Law, but I felt that it was even more fully explored and explained in the sequel. We discover what has happened to the kandra, and we delve deeper into the religions, we see how the characters view the events of the first series and what they know of those characters. Something else that makes Shadows of Self so fun to read is what we know about Harmony, which makes the events at the end that much harder to swallow (and can I just say that the ending of this book is what made it for me. Brilliantly done). Another thing that I love about the second Mistborn series is the humor, and Shadows of Self takes that to a new level by focusing on my very favorite character, Wayne. One of the reviews I read said that they could do with “a little less schoolboy humor,” but I found it hilarious, so apparently schoolboy humor is my brand of funny. The character development is, overall, fantastic. I love what we learn about Steris, Wax’s betrothed, and the little bit more that we get of her (I have to say that she’s becoming a favorite. How does Sanderson do this to me with so many characters?! ), and other minor characters, are incredibly well-done. I found Marasi to be a little bit too complacent and accepting this time around (specifically at the end), though I really loved getting to see more from her point of view. My favorite character, however, is the villain of the book. I can’t explain much because spoilers, but trust me, it’s good. I also want to take a moment to give Sanderson props for not forcing a romance. I was worried, after the events of Alloy of Law, that there might be a love triangle aspect, but thankfully, there is not. Overall, I adore this entire series. But I am getting a bit tired of the overarching theme: faith is about believing in something when you don't have all the answers, and that faith is believing in something good when bad things happen. I appreciate the struggles that the characters, and especially Wax at the end of Shadows of Self, have and how they deal with them, but by book five it feels a bit overdone. Regardless, this series is one of my all-time favorites, and will be subject to many rereads in the future. If you haven’t read the Mistborn series yet, start with the first one, simply because it’s incredible. The easter eggs you’ll get in the second series are just an added bonus. Written on 24th December 2015 by Vanessa.